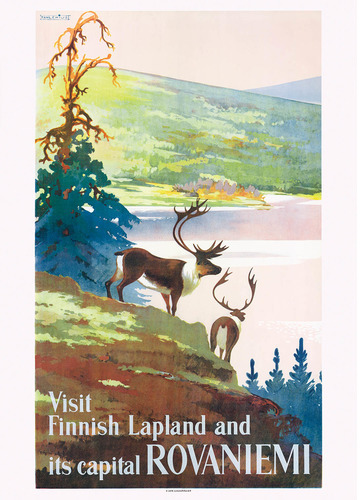 During the 1930´s the local and national Tourist Associations worked hard to promote Rovaniemi and Finnish Lapland as an exotic destination for the adventureous traveller. Small hotels were built, among others the proud ”Fell-hotel” at Pallas. Lapland was blown to smithereens and all the money was gone. The only conclusion to be drawn was that tourism had to be relocated from the east and north to the west, south and centre of Finland. 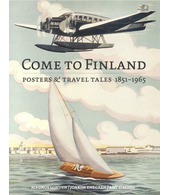 The future lay in the archipelago and the lakes, it was thought – Lapland would have to wait. This poster is unique since it’s actually promoting ruska (autumn colors), to our knowledge the first Finnish travel poster doing so.